The PIC hearings resume. The Public Investment Corporation (PIC) has been given until the 13th of March to recover the capital investment of R4.3 billion made to Ayo Technology Solutions. The PIC confirmed on Tuesday that it received a compliance notice from the Companies and Intellectual Property Commission (CIPC) ordering it to recover the funds. Acting company secretary, Wilna Louw, told the commission into the PIC that the notice was received last Thursday. Meanwhile, The National Assembly passed the Public Investment Corporation Amendment Bill on Tuesday. One of the objectives of the bill is to promote transparency and good governance within the PIC. 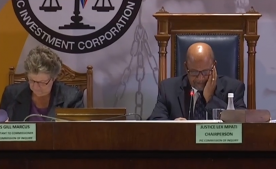 The post WATCH: PIC Hearings appeared first on SABC News – Breaking news, special reports, world, business, sport coverage of all South African current events. Africa's news leader..